With 2015 almost over, it's time to start looking ahead to what 2016 has in store. Now, we know that with Star Wars: The Force Awakens opening this year, it is going to be a tall order trying to top 2015. However, 2016 certainly seems intent on giving it a try. This could be the biggest box office year yet! It would be very hard for one film to compete with the massiveness that is Star Wars: The Force Awakens. And that is why one shouldn't even contemplate trying to go head on with that mack truck of a cinematic spectacle. If one, however, takes all the films from 2016 together, they certainly serve notice that the rest of the movie industry hasn't been asleep these past few years. And the best part? The slate for 2016 is probably the most diverse, for tentpole properties, that we have seen in years. We have films to satisfy your superhero tastes, your comedic tastes, your dramatic tastes and even your Star Wars taste. Okay, I know that we probably could've just said sci-fi instead of singling out Star Wars, but lets be honest, the release of anything STAR WARS related is pretty darn big deal right now. This doesn't even take into account that we'll have a new installment in the Ghostbusters franchise! If you look at all the films that are slated to be released, it is almost enough to make one wonder what year this is. We have films that reinvigorate franchises from the 80s (Ghostbusters), the 90s (Independence Day: Resurgence) and of course the various sequels to movies released in the 2000s and beyond. So sit back and get ready to be stoked, because in addition to all the reboots and sequels, there are some new films on the docket that will surely inspire more reboots and sequels. I know it might seem like we are taking a tongue and cheek approach to this list. It might seem like we are just biding time until Star Wars: Episode VIII comes out, but that is clearly not the case. What we have done is try and bring you the films that will hopefully make the biggest waves at the box office (and the biggest dent on your cinematic mindset). 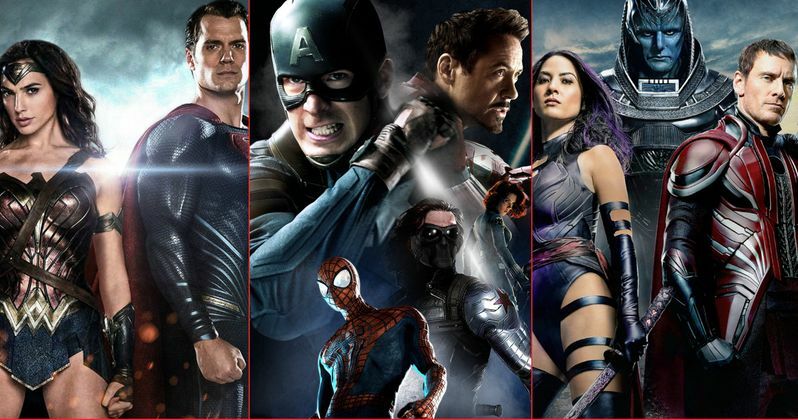 So without further adieu, enjoy our "27 Big Movies You Can't Miss in 2016"! Four-time Oscar-winning filmmakers Joel and Ethan Coen (No Country for Old Men, True Grit, Fargo) write and direct Hail, Caesar!, an all-star comedy set during the latter years of Hollywood's Golden Age. Starring Josh Brolin, George Clooney, Ralph Fiennes, Tilda Swinton, Channing Tatum, Scarlett Johansson, Jonah Hill and Frances McDormand, Hail, Caesar! follows a single day in the life of a studio fixer who is presented with plenty of problems to fix. Who doesn't love a Coen Bros. movie, right? And with their skewed take on just about everything, this film could possibly be the best send up of the filmmaking world. EVER. Based upon Marvel Comics' most unconventional anti-hero, Deadpool tells the origin story of former Special Forces operative turned mercenary Wade Wilson, who after being subjected to a rogue experiment that leaves him with accelerated healing powers, adopts the alter ego Deadpool. Armed with his new abilities and a dark, twisted sense of humor, Deadpool hunts down the man who nearly destroyed his life. Ryan Reynolds is that rare actor that can handle both comedy, action, and drama. In the role of Wade Wilson/Deadpool, we just might have an answer to Robert Downey, Jr.'s Tony Stark/Iron Man. For superhero fanatics, or just plain fans of action movies, Deadpool is a can't miss proposition. A sequel to Ben Stiller's 2001 hit comedy revolving around male fashion model Derek Zoolander. Okay, simply knowing that Ben Stiller, Owen Wilson and Will Ferrell are returning is enough to make us want to see this film. But the plot finds Derek and Hansel teaming up with Penélope Cruz to stop an evil madman from killing all the beautiful people in the world. And the trailers are drop dead funny! We're taking what we know about Zoolander 2 and running with it. This could end up being the best comedy sequel of the year! The modern mammal metropolis of Zootopia is a city like no other. Comprised of habitat neighborhoods like ritzy Sahara Square and frigid Tundratown, it's a melting pot where animals from every environment live together-a place where no matter what you are, from the biggest elephant to the smallest shrew, you can be anything. But when optimistic Officer Judy Hopps arrives, she discovers that being the first bunny on a police force of big, tough animals isn't so easy. Determined to prove herself, she jumps at the opportunity to crack a case, even if it means partnering with a fast-talking, scam-artist fox, Nick Wilde, to solve the mystery. Jason Bateman voices Nick Wild? Count us in! That actor could recite the phone book and we'd show up. Fearing the actions of a god-like superhero left unchecked, Gotham City's own formidable, forceful vigilante takes on Metropolis's most revered, modern-day savior, while the world wrestles with what sort of hero it really needs. And with Batman vs Superman at war with one another, a new threat quickly arises, putting mankind in greater danger than it's ever known before. One has to love the dark direction that director Zack Snyder has taken this film. If the early trailers are any indication,Batman v Superman: Dawn of Justice could be 2016's Star Wars: The Force Awakens. With it's multi-layered characters and a nod to today's global political situation, this film might be more timely than ever.